Rare, large lot with beautiful views in coveted Northwest Hills! Buyer may bring their own builder has great builder option. No property to scrape, just a clean lot that is ready to build! Adjacent lot is also available. Don’t miss this rare opportunity. Directions: From Mopac and Far West go West to Mesa Dr. Left on Mesa Dr. to Mesa Cove. Left on Mesa Cove to property on the right. 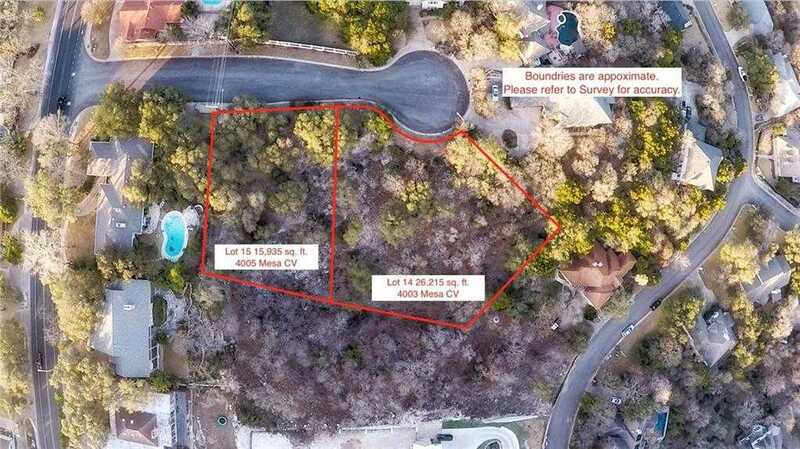 Please, send me more information on this property: MLS# 1763435 – $600,000 – 4005 Mesa Cv, Austin, TX 78731. I would like to schedule a showing appointment for this property: MLS# 1763435 – $600,000 – 4005 Mesa Cv, Austin, TX 78731.